If you are heading to Peru to discover the Amazon rainforest, chances are you will be headed in the direction of Iquitos, the gateway to the Peruvian Amazon. Just a native village over 150 years ago, thanks to the European investment and immigration of the Rubber Boom and subsequent advances in tourism, it has seen vast growth in size and population to the extent that it is now the largest city in the Peruvian Amazon with some 500,000 inhabitants. Iquitos is isolated by surrounding rivers and jungle, with no road access to the outside world, the city has acquired a unique culture whose European influences can still seen in the architecture of the historic Casa Morey (well worth a stay!) and Casa de Fierro (Iron House) designed by Gustavo Eiffel, and a charm that attracts thousands of visitors every year. A trip to the Amazonian Manatee Rescue Center allows visitors to learn all about these graceful endangered animals - and even bottle feed the baby manatees who stay at the center until they are 2 years old when they are reintroduced into the wild. Just 4.5 kms from Iquitos airport on the main Iquitos to Nauta highway the Center is a popular inclusion on many Amazon cruise itineraries. Learn all about the life cycle of butterflies and get to meet some of the animals that charismatic owner Gudren Sperrer has rescued over the years, including Pedro Bello, a 5-year-old jaguar, rescued as a cub. There are also alligators, a manatee and lots of monkeys. Watch out for the cheeky Red Uakari monkeys who'll steal anything they can get their hands on! Best to take a bunch of bananas and bribe them to leave you alone. To get there, take a motocarro to Puerto Bella Vista Nanay and from there a 15-minute water taxi ride to the village of Padre Cocha. From there it is only a short walk to the entrance of Pilpintuwasi. Tue-Sun, 9:00am to 4:00pm, $5. A popular excursion is a visit to the nearby Bora Bora or Yagua indigenous communities who live on the Momon River, near the village of San Andres. Enjoy a tribal song and dance (don't be surprised if you are asked to join in!) and take the opportunity to purchase some handicrafts, the money from which is often used to buy much-needed medical supplies for the community. You can even test your Amazon survival skills with some blow-dart gun shooting practice. To get there, take a motocarro to the port of Bella Vista Nanay and from there rent an aluminium speedboat for an hour or two to take you the 20-minute ride to San Andres. The wildlife of the rainforest can be very elusive, so a visit to Quistococha Zoo is you best chance to see Amazon animals up close. Big cats like jaguars, pumas and ocelots are there, along with capybaras, caiman, numerous species of monkey, parrots and even Giant Amazon Otters. The zoo also features a serpentarium and pools of Amazon fish like the prehistoric paiche and sabalo. There are two ways of getting to Quistococha Zoo, one by bus and the other a half-hour (20 soles) ride in a motocarro. Well worth the trip and don’t forget your swimming gear for the lake! Tip: Below the zoo is a beautiful lake and a sandy beach, called Playa Tunchi, surrounded by small restaurants serving delicious Peruvian cuisine. Mon-Sun, 9:00am – 5:00pm, 5 soles. The floating village of Belen is a miraculous sight, a community of wooden family homes tethered to large poles, from which they float upon the river's rising and falling waters, some incredibly floating year-round. You can take a cruise through the flooded streets during high water very easily by renting a wooden palm-roofed boat called a peke-peke. You can find these below the Boulevard and are available to rent for about 30 soles per hour. Just 11 blocks from the Plaza de Armas up Prospero Street lies the sprawling Belen Market, selling everything you can think of and, more likely, lots of things you can't! Your typical jungle fruits, vegetables, fish, meat and poultry can all be bought here, along with unusual items like coca leaves, mapacho tobacco, turtle eggs, snails, and even cows udders. Don't miss the Pasaje Paquito or "Medicine Lane", an entire block lined with stalls selling natural plant (and animal) medicines from the region which the vendors claim can cure almost anything including diabetes, cancer, arthritis and baldness. There's even a medicine to bring your runaway wife back home (if you want). A great way to spend an hour or two. Daily from 5:00 am. Best time to visit is early in the morning. This brand new and superbly curated exhibition is a celebration of the indigenous cultures of the Amazon Basin, not just Peru. Drawn from the extensive collection of renowned biologist Dr. Richard Bodmer, the many fine ethnographic samples on display include feather headdresses, ceremonial objects, musical instruments, and hunting tools, all of which provide a great insight into how the Amazon's indigenous peoples interact with nature and the rainforest in which they live. Malecon Tarapaca 332, daily 8:00am to 7:30pm, 15 soles. Known as "The Boulevard", the Iquitos' malecón is a pedestrian promenade overlooking the river and is a great place to hang out in the evenings. Things normally get going around 7:00pm and usually goes on 'til gone 11:00pm. Why not drink a cold beer outside one of the many bars and restaurants facing the boulevard, listen to great music, enjoy a meal or just watch the street entertainers. Tip: The local capoeira club always gather at about 8:00pm to practice, giving you a free acrobatic display of this Brazilian martial art. Some two hours down the Amazon by fast boat lies Monkey Island. This sanctuary was provided because here in the rainforest monkey meat is on many of the locals diets. Local people shoot monkeys to eat and sell the babies as pets. The protected 200 hectare island is inhabited by 9 species of monkey in 10 family units, roaming freely and feeding off a variety of fruits such as starfruit, banana, pineapple, cocona and guava. These were specially planted to ensure the monkey’s staple diet is maintained. As soon as visitors arrive at the island the monkeys swarm towards them so it’s always best to take some bananas with you so as not to disappoint them. You can go for a walk through the rainforest and the monkeys will follow you, one even leading you by the hand. There is no charge for visiting Monkey Island but visitors are expected to make a voluntary contribution for the upkeep of the sanctuary. Allow a full day for this trip. To get there, take a motocarro to the port of Bella Vista Nanay and from there rent an aluminium speedboat for a few hours to take you the 45-minute ride to the island. 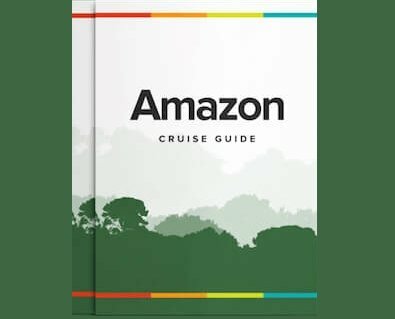 What top 10 things to do in the Amazon list would be complete without an Amazon cruise? The feeling of sailing down river and witnessing the beauty of the rainforest unravelling is something to behold. Visit the wildlife-rich Pacaya-Samiria Reserve or even take a cruise to the tri-border with Colombia and Brazil! From budget to luxury, Rainforest Cruises has you covered. Cruises range from 2 to 10 days in duration, and offer a wide selection of daily excursions and activities. For more information, contact one of our Amazon cruise specialists here.